When my family and I first moved to the island, on the very first ferry trip with our stuff, I brought my car. I was told told, 'you don't want that out here, it won't last.' 'That' was my gray 1989 Mazda 626, then a tender 17 years old. The car lasted about eight more years, which is six and a half more than most of the macho-man pickup trucks out here. Vehicles, especially pickup trucks are inadvertently engineered to dissolve in our bracing mix of air and salt and humidity. The Mazda's advantage was that it had a single body instead of a cab and pickup bed, which tend to part company after enough years in refreshing salt air. Most of us have at least one more vehicle than is operable at any one time. Cars and trucks break down and are difficult to schedule for repairs. Sometimes they just get left out of current rotation because the other one is better. Tires and batteries then go flat, things rust, shrubs take over. The Mazda was still commissioned but not on active duty for a couple of years when I decided to fire it up. The exhaust system was left in pieces around the island years before, so the little car could be heard from some distance. It was a happy thing to have it running again, if only briefly. A couple of days later, as I returned up Carrie's Hill from the harbor, old 626 seemed a little crooked, the body not pointing in the true direction of travel. A slight correction turned into a more dramatic misalignment as now I was really pointed a different direction than I was moving. So it went, this way and that way and not this way and not that way til I got to the driveway. The passenger's side rear wheel and whatever frame pieces held it in place had let go. I couldn't see a way to hank it back together with potwarp and so had exhausted my menu of solutions. 626 hobbled onto the ferry thanks to Nick Philbrook, highly skilled in such maneuvers. Since I paid $1,500 for it, drove it on the highway for a year or so and then had some good years here, I guess I made out well. Humble vehicles work for me. My S-10 pickup is as style free as it is reliable. No hoisted up shocks or deerjacking light rack on top. No radiator grill with teeth or predator shaped eye holes. Just a cab and bed an a seemingly flawless engine at age 27. The S-10 has been the dormant vehicle for a couple of years, cultivating berry canes and collecting a thick coat of dust in the interior as it sat by the road with the driver's window left open. That window typically stays open because it's easier to reach in and open the door than to crawl in from the passenger's side where the outside handle works. I figured S-10 shouldn't sit too long and made a couple of attempts to revive. I figured out that it needed a new battery after which installation it fired up immediately. The engine sounded as smooth and hearty as new. I decided to gild the lily and clean up the interior a bit. There was no Armor-All involved, which wouldn't have helped much with the one dormant and one active wasp starter nest. The dormant one was poised on the opener of the glove box, and the active one I discovered in the gas filler compartment. The cab had several years' worth of bits and pieces of things left in the cab and across the dash. 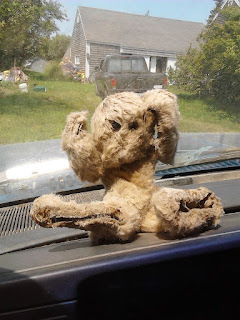 I saved two items- one very weathered stuffed bunny (see above) and a small plastic disc from a music box found on a beach here and remembered from my childhood in Bowdoinham. The broken dandelion digger, stray computer mouse, a footwell full of change most of which I had lost to Tom and Rick and Steve at poker, a roll of blue crepe paper well past its festive days and bits of seaglass all were recycled or put away. The 2008 global financial crisis is an enduring fascination to me. It took a chain of the less admirable elements of human nature working independently, but also in concert to pull it off. Clinton signed the repeal of Glass-Steagall. Coked up and commission-incentivized mortgage brokers sold exploding adjustable mortgages to individuals and families who had no idea what they were getting into. Upward pressure on real estate prices ensued. Mortgages were batched together by the thousands and used as collateral for investment bonds. Bond rating agencies carefully examine the bond issues from 47,000 feet and pronounce them A-OK.
Then it gets a little fucked up. Financial geniuses figure out how to buy and sell the risk of default, meaning a company gets paid for assuming the risk of bond failures and the opposing party in the deal gets a payout if there is a default, creating a reward for a bond issue tanking. Then it gets very, very fucked up. Investors start entering into these transactions multiple times over for the same underlying real estate equity, which is something like taking out 6 insurance policies on the same house and hoping for a sextuple payout when it goes up in flames. Then it gets very extremely fucked up. In one corner of the swamp, and by way of example, one large investment bank and a savvy deep pocketed short seller actually see that loading bond issues with the worst mortgages will generate the largest payout. A bond ratings agency say "A-OK, good buddies." Said festering stinkpile of bonds is marketed to a German bank which comes to regret it. If I sound like Elizabeth Warren, google Abacus, John Paulson and Goldman Sachs. The bigger tsunami took down Bear Stearns, Lehman Brothers, launched the Great Recession, and came barreling into Matinicus Harbor one beautiful September day in 2008. For a short while in 2008, our lobster dealer tied the Jacob Pike in lower harbor, bought our lobsters and dispensed fuel and salted herring. As John and I left the harbor that morning, aboard Natalie Irene, the boat price for lobster was $3.40 or so, not great, but enough to make it worthwhile. It would be half that by afternoon. Sometime while we were out on the water, Glitnir, an Icelandic bank, failed. Icelandic bank failures were not on my mental list of concerns that morning. As we moved from string to string, I was probably stewing about having enough firewood, or some family strife, or trying to write a song in my head. Lobsters came up. Traps splashed back into the cold, rich water. Wrists got sore. Bait bags got refilled. I tried to keep up. The day went along as expected. Some time further along, New Brunswick lobster processors, to which most of our catch was sold found that Glitnir, being out of business, could no longer issue them letters of credit for operating funds. Letters of credit issued to New Brunswick lobster processors were also not high on my anxiety inventory. When we sidled up to the Jacob Pike, we were advised of two things. First, the boat price was now $1.70, if I'm remembering the figure correctly. Second, as a bonus to getting our pay cut in half, we were advised that the dealer would not be buying any more lobsters this week. There was no market for most of our lobsters. That was just the beginning. Fortunately, even though the housing crash triggered an employment crash, homelessness and large swaths of suffering, we can take some comfort that the good folks at AIG, Goldman Sachs, JP Morgan Chase and others didn't take too much of a hit on the bonuses issued in recognition of their achievements. Cats as they say always seem to be on the wrong side of the door wanting in or out depending on which they are not at present. I've felt a little the same way during the always nerve jangling May/June transition back away from full time office work and onto the water. I felt as though the good weather only happened when I needed to be inshore for business and once I finally got to the island, some urgent business inevitably popped up on the mainland. I also maintained an umblemished record of only showing up on Matinicus when it was unusually cold and damp. April was cold gray windy and sour and lasted until the second week in June. When the weather finally snapped, we went from putting on 4 or 5 layers before even thinking about going out on the boat and needing a fire every night to panting in the heat on the water at 7 a.m.. There was no transition during which to acclimate- somewhat like getting helicoptered into base camp and wondering if there just isn't very much air this far up. Loading and trucking five pickup loads of traps, rope and buoys to the wharf and I was dehydrated like jerky. Then the gear gets stacked on the boat. Then it's time to actually go to work. Back to the cat. Seamus does not care for traveling. He does not enjoy being menaced by other cats out here either. Last year, it was "Crazy Eyes," so named by Megan loosely after an Orange is the New Black Character. Crazy Eyes is a siamese with divergent or overly convergent visual fields for each eye, and who was found sleeping on our bed one day, and on another occasion chased our cat through our house, hissing and slashing. My super soaker eventually connected enough times to get the hint across. This year a large orange cat and a fluffy black one are intruding on our peaceful enjoyment of the manor. In the old days, during which I would've lasted about five minutes here, I expect a menacing cat's owner might get one conversational attempt at settlement before the animal would be stapled to the owner's shed door. Seamus and I, both being fairly timid souls, haven't figured this out beyond keeping the supersoaker- as is our sacred 2nd Amendment right- loaded with the safety off next to the door. The next idea is a cat door where he can let himself in, and where I hope other cats do not invite themselves in. This way, he can stay here on his own when we have to be inshore and can come and go as he likes. Without thinking it through too much, I picked such a door up at the hardware store and opened the package to discover that it was designed to be embedded in a people door, not installed in a wall. The hardware, specifically screws, were not going to make it work where I wanted it to. After a little Matinicus problem solving with surprisingly little profanity and drilling my own holes in the pet door frame and screwing each piece onto either side of the wall, it was time to introduce Seamus to his new portal of independence. I put a dish of his favorite treat on the outside and showed him. He walked right through and paid no attention to the dish. Hearing strange noises upstairs a half hour later, I encountered Big Orange coming down the stairs and hurrying out, having already memorized the location of the cat door which was not intended for his benefit. Now what? After a winter of desk work, I was more than ready to get back to the island for the year. My personal abrupt climate change started with me in a suit on Wednesday afternoon when, after a transaction, I met up with Eva to pile roofing supplies into the recycling truck. On Thursday I was happily decked out in comfy well worn work clothes. The crossing was sunny and beautiful. The malfunctions came as they usually do. 1. My first task was to get a truck going so that I could drive to the recycle barn and retrieve my groceries and other stuff before the seagulls got to them, or the freezer items melted. The black truck was four for four on flat tires, but my handy new compressor had her back to proper elevation in a few minutes. Next I needed ignition and combustion. After a couple of unsuccessful turns with the battery powered jumper go-go box, I went to politely wiggle the battery connections, one of which promptly transformed itself into four or so partial battery connections and fell through engine area and onto the ground. Knowing how they built things in the 1940s, I pushed up the hood of the once dark green pickup truck parked in the trees out back. "It was running not that long ago," I was told when I moved here; not that long ago being possibly during Ford's term of office. By amazing good fortune, one of the battery terminals came out easily, and if melted down could make a dozen of the new ones. The go-go box still couldn't quite bring Black Beauty out of hibernation. Samantha's full size GMC was another story. Black Beauty sensed the roar of 8 cylinders and whinnied to life instantly. 2. Megan and I reroofed the middle section of our house, and refurbished the cedar shingle siding with nice clean white solid color stain. Aside from discovering that my knees and confidence at heights are not what they were a scant few decades ago when this was my work, setting and moving staging humbled me the most. Being on the roof and needing to dismantle one set of planks, move them up and restage the next layer are plenty enough of a challenge. As a bonus, though, one of the 16 pennies I set to keep the planks together lost its head as I - again politely- encouraged it to let go. So here we are, up on the roof and ladder jungle gym with a spike firmly holding two planks together and nothing to reef on. Profanity, a pry bar and a nail punch did the trick. It was good that we pushed the roof and siding job through on the early side of our time here because as I write, inches from the wood stove, I am counting 6 consecutive days of sour cold damp weather. 2.5. How to bury two- not one- two chainsaws. Thursday morning came in around 37 degrees and promising little warmth and no sunshine- perfect weather for tree clearing. Bucking up blown down spruce trees and hauling off the obstinate, tanglesome brush are things to do when it's chilly because it is impossible to be cold while doing these tasks. There were many new blow-downs awaiting us at the property we help look after. The whole island, or at least large swaths of it, has spruce trees that have either over matured or picked poor places to try and stand up because there are many large trees down every spring. When Fiona was enjoying the view from the roof ridge pole, she could see water in two directions, which was not the case when I first began cleaning the chimney and enjoying the view 10 years ago. Our mission for Thursday was a half dozen blow-downs intruding onto the yards and roads of the friend's property. One in particular was a non-conformist. I believe it was a fir tree rather than the spruce, whose eccentricities I have learned. This tree was bent like a rainbow and partially split near the base. That made me wary. I decided to work from the top to the base, lightening up the remaining portion. I thought the potential large heavy wooden surprises were accounted for because all that was left was 5 or 6 feet of trunk at the base. I figured I'd just cut through it and knock it over. Usually, when the weight is off a tree, so is the tension and the hazard of getting the saw stuck. This tree, though, had memories of standing straight up and was, unknown to me, planning on doing just that, so when I cut into it on the uphill side, the saw was quickly entrapped in a vise of fiber memory as the small bit of remaining trunk tried to stand back up straight. Fortunately, we had a second saw. I figured I'd just run that one through a ways up, and take the strain off, except that it's not strain but recoil. The tree trunk, even a few feet of it, really, really wants to stand back up and so I buried the second saw in exactly the same way. Rope, pry bars and fishermen's prayerfanity eventually freed saw #2 which helped liberate saw #1, but only after more splitting and unpredictable tree behavior. 3. Waterfalls are lovely in their proper place, which is not in a closet. Since the mice and rats had an extra enthusiastic time in empty houses this winter, and since the weather made other outdoor pursuits pointless, we decided we'd go take a swipe at decontaminating Megan's family home on the south end. This started with turning the house-closing checklist from last fall upside down and starting where we finished a few months ago. Faucets were closed, valves opened, main breaker thrown and all seemed just fine for a few minutes. Then there was a vigorous running water sound where it was not welcome or anticipated. Water cascaded down through a bedroom closet. The upstairs bathroom was flooded, but not from any visible source. Under the sink, I pulled up the bottom of the vanity cabinet and could see with my practiced eye, that it was garden hose kind of wet in there. Megan turned the water back on and I saw the leak in an awkward but not impossible place. Pex plumbing- using poly ethyl something instead of copper tubing for water supply lines is apparently as delicious to rodents as it is quick and convenient to install. Not only did they parade their rapidfire pooping, jar knocking over selves all around the house, but they also ate into our water lines. Good fortune or common sense planning again paid off as there was a full pex kit in the barn. After trying to recall the one time I helped install the stuff and fiddling with the cutter and crimper tools, I started dismantling the vanity because of course the little shitters had to chew into where I couldn't fit the tools or my hands to mend the line. Feeling ever so puffed up, I asked Megan to turn the water on to test my mending job. The repaired spot looked great, especially compared to the additional two chewed places further into the space that I hadn't seen before, but which were now spit-in-your-eye obvious. The next two fixes were easy enough and nothing sprayed when Megan turned the water on for the third time. I reassembled the vanity, and Megan soon had the craptracked biohazardous wasteland turned once more into a shiny and inviting place. With heat starting to reach the corners, and things smelling and looking much better, we stepped back out into the cold rainy easterly and headed for Aunt Belle's.